The festival will include tours of several top breeding farms in Iceland, horse shows and markets, and culminate on Apr. 2 in a large parade through Laugarvegur, the main shopping street in the center of Reykjavik, where visitors can attend the Gobbidígobb (Clippity-Clop) Family Fair. There will be free admission to events for the whole family, horseback riding, arts and crafts, and live music. The final event continues into the night of Apr. 2 with a tölt competition on ice held at the Reykjavík Skating Hall in Laugardalur, next to The Reykjavík Zoo and Family Park. The tölt is a fifth gait specific to only a handful of breeds in the world and provides a smooth ride that feels like gliding. In fact, riders often demonstrate this smooth gait by holding large glass mugs of Icelandic beer while riding, never spilling a drop (and, of course, saving the drinking for after competitions). When Vikings arrived in Iceland 1,000 years ago, they brought the Viking horse with them and these purebreds have not changed since. 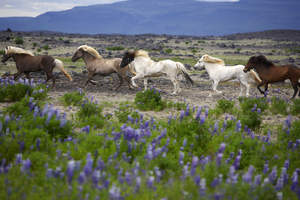 Importing horses is prohibited and if a horse leaves Iceland it cannot return. There are over 100,000 Viking horses in Iceland, many of which are wild and roam the countryside. Strong and muscular, yet small and gentle, with great stamina, speed and intelligence, they are the perfect riding companions for handling the rough Icelandic terrain. Horseback riding is a sport that can be enjoyed in Iceland year-round. The horses are friendly, docile animals that take obvious pleasure in carrying their riders across grassy plains, up and down rocky slopes, through rivers and over rough lava, offering travelers a unique way to enjoy the splendors and nature of Iceland. The Icelandic horse is perfect for the beginner rider. Tours of up to several days, often through interior areas difficult to reach by car, can be arranged for more experienced riders.